Experience the magic of virtual reality. 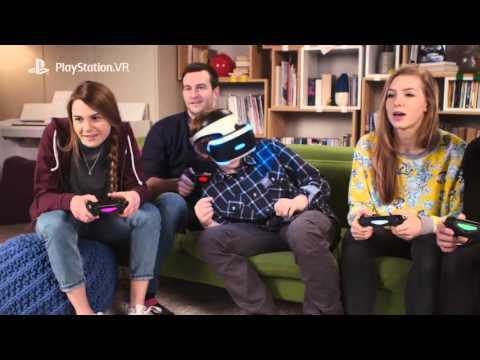 Grab your PlayStation VR headset while up to four friends join in with a DUALSHOCK 4 wireless controller each. Then enjoy a variety of action-packed mini-games which has you diving into everything from a hilarious cat and mouse chase to clearing a haunted house of its ghastly ghosts. Whether you’re working co-operatively or competitively, the adorable interactive VR Bots are on hand to make sure you have a blast. There are plenty of fantastic mini-games just moments away in THE PLAYROOM VR – but you also have space to kick back and chill in a virtual bedroom, too. This is the home of the loveable VR Bots, who are playing games, socialising and even working out. Don’t forget to check out the high-tech vending machine. Complete any of the mini-games and you earn coins to play the machine and win toys, which you can then use to decorate the bedroom any way you see fit. Have a little fun and get into THE PLAYROOM VR spirit! No matter who you choose, eventually you’ll come face-to-face with each other in a final, climactic showdown. Become one of four crafty cartoon mice in a quest to steal as much cheese as possible, using your DUALSHOCK 4 wireless controller. Or assume the role of the PS VR headset wearing cat, hiding behind curtains and ready to pounce out to catch the rascally rodents. It’s a frantic battle of nerves – will you be the hunter or the hunted? Creep inside of a haunted house, armed with your DUALSHOCK 4 wireless controller and stalk some spectres. With your friends watching via the TV, cooperate to keep an eye out for anything suspicious, and then use your ghost blaster to shoot and capture the sneaky spooks. But hurry – the clock is running out! Think you’ve got the wits to pick out the bad guy from a crowd in the Old West, stranger? Then step into the saloon and prove your worth. Rustle up a few eagle-eyed partners and choose which lily livered varmint deserves to be zapped away for a night behind bars. Don’t get it wrong, though – or you could get a face full of plungers for your trouble. A wild virtual reality 3D platform adventure awaits! 20 VR Bot buddies are stranded in a world full of traps, and only you and a friend can save them. As one of you dons the PS VR headset to control a VR Bot who can jump, punch and use a grappling hook to rescue his lost comrades, the TV player gets a different viewpoint on the action, flying a UFO and providing air support. Create an unbeatable team and become the heroes these brave VR Bots deserve. Are you ready to defend your bedroom from an exhilarating alien invasion? Then put on your PS VR headset, jump into a gun turret and blast your way through the relentless extra-terrestrial torment. If you need a helping hand, up to three friends can join the fight via your TV and a DUALSHOCK 4 wireless controller each. Download THE PLAYROOM VR on PS4.